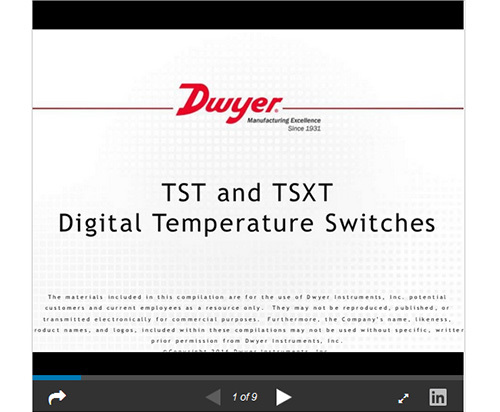 The SERIES TSXT Digital Temperature Switch is designed for refrigeration control. 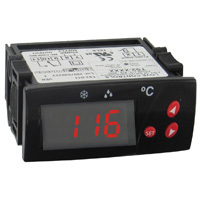 It accepts PTC or NTC temperature probe types and can control the compressor, defrost, fan, alarm, and light in a refrigeration system. Master/slave configurations allow synchronization of defrost cycles between different units. Programming is performed through the front keypad, or by using the TS2-K programming key. NOTE: All purchases of the RED display require 50 units or more. PTC: -58 to 302°F (-50 to 150°C); NTC: -58 to 230°F (-50 to 110°C). PTC (1000 Ω @ 25°C) or NTC (10KΩ @ 25°C) thermistor. Relay 1: SPST relay rated 16 A @ 240 VAC resistive, 10 FLA, 60 LRA; Relay 2: SPST relay rated 5 A @ 240 VAC resistive; Relay 3: SPST relay rated 8 A @ 240 VAC resistive. 115 VAC, 230 VAC, 24 VAC/VDC, or 12 VAC/VDC. 3.6 VA @ 115/230 VAC; 1.5 VA @ 12/24 VAC/VDC. 32 to 131°F (0 to 55°C). 115 and 230 V models: 7.2 oz (204 g); 12 and 24 V models: 4.8 oz (136 g).